The new grant scheme will facilitate important comparative research. Under a similar grant program, MLS academics collaborated with Associate Professor Meng Seng Wee from the National University of Singapore. 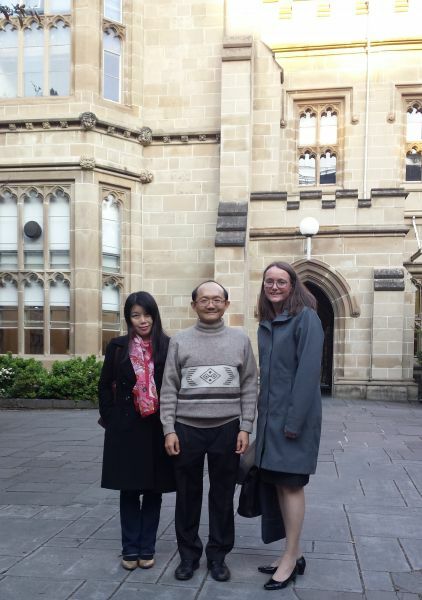 Associate Professor Meng Seng Wee is pictured above with Associate Professor JIN Chun of Doshisha University and Associate Professor Stacey Steele (MLS). The Renmin - MLS Research Partnership Grant will award successful applicants with AUD $20,000 over a two-year period. Both law schools have contributed funding for the grant, which will enable researchers from each school to collaborate on a legal research project. MLS Associate Dean (International) and Director of the Asian Law Centre Professor Pip Nicholson said the new Renmin – MLS Research Partnership Grant will serve to further strength ties between the University of Melbourne and partners in China, particularly Renmin, widely acknowledged as a leading Chinese law school. “The new Renmin-MLS Research Partnership reflects the need for academics from Australia and China to collaborate on research supporting much needed comparative insights,” she said. Professor Nicholson said MLS academics frequently partnered with colleagues from across Asia and the world on a variety of important research projects and the Law School already supported a number of similar grant schemes. “For example, with the help of an MLS-Asia Research Collaboration grant, Dr William Partlett collaborated with Anatole Boute from the Chinese University of Hong Kong on post-socialist energy constitutionalism,” she said. Under a similar grant scheme, Associate Professor Stacey Steele and Professor Ian Ramsay conducted research with Associate Professor Meng Seng Wee from the National University of Singapore regarding the disciplining of insolvency practitioners in Australia and Singapore. “Increasing collaboration through partnerships like this one with Renmin Law School is an important way not only to build relationships across the region, but also to facilitate important and insightful legal research,” Professor Nicholson said.